Being a Florida native and from a family that loves the water as much as I do, I naturally was introduced into the Florida waterways at a very early age. I was blessed with the opportunity to fish from small ponds, lakes and rivers, to bays, backcountry waters to the Atlantic Ocean and Gulf of Mexico. While growing up my true passion was the water and still is today. I have fished from a 57’ sportfish for many years. It taught me a great deal of offshore knowledge from deep dropping for sword fish, to just having fun bottom fishing and trolling for pelagic species. 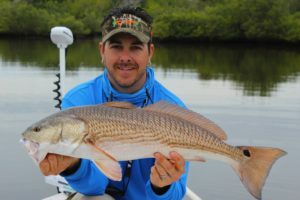 I have also fished many years inshore from sight fishing the Florida Keys to Saint Augustine, learning the subtle movements of fish in the water. Living in the Daytona area I started exploring the backcountry creeks in a kayak, and learned them well. I have extensive knowledge of the waterways from Tomoka state park to Mosquito Lagoon. As I progressed I eventually purchased a poling skiff which gave me greater range and visibility on the water. From then on I have been running the backwater creeks to the intercoastal waterway watching and catching many species of inshore fish. As much as I love inshore fishing I still have a deep passion for offshore fishing. I did extensive research on hybrid boats, something that could handle rough water yet still go shallow. The Andros Bonefish has proven to be a FISHING MACHINE. It can take us miles offshore but still able to go where most flats boats can go. I have fished offshore from the wrecks to artificial reefs, to cruising the beach for tarpon and cobia. I also have trolled many of hours looking for that big explosion to come crashing down on the plugs. My name is Captain Dave Caruthers and I cannot wait to share a piece of Florida’s paradise with you, your friends and family!